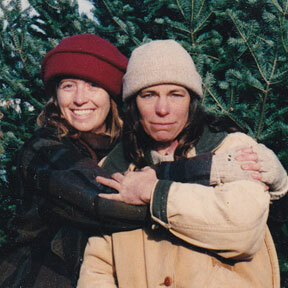 In another lifetime, I lived and worked on an organic farm in far northern Maine with my mentor turned best friend, Lorna. We ran a small CSA together, doling out a weekly supply of vegetables to a dozen or so families. Lorna taught me a lot of things – and how to grow vegetables was just the tip of the iceberg. She taught me how to change the muffler on my truck. She showed me how to be quiet and wait. She taught me how to split and stack wood. She encouraged me to look at things differently. And, best of all, she taught me how to cook without a recipe. Lorna’s cooking style is amusing. She’s the type who drizzles the honey into the bread batter two feet above the bowl, just to see the pattern it makes. But perhaps her best culinary trait is that she cooks with what she has. There’s no running to the Shop & Save twenty minutes away to pick up this or that. Lorna inventories her kitchen like a true chef. And if she has a surplus of some particular ingredient, you can bet it will be front and center on the menu. This happened so often in my cooking forays with her, that I coined a term for it. The “_____ intensive meal.” If there was bread about to go by, I knew we’d need to come up with a bread intensive meal. An onslaught of broccoli demanded a broccoli intensive meal. A surplus of eggs? You get the idea. Lorna doesn’t really need a cookbook. She just needs to know what’s in the pantry. I admire that. The other night as I was drifting into that wild space where the conscious and subconscious so effortlessly mingle, I remembered the two pounds of bacon that has been lingering in our fridge. A bacon intensive meal, I thought. Must-make-a-bacon-intensive-meal. And then sleep washed over me. Fortunately this bit of brilliance was still with me in the morning. Only I wasn’t quite sure what comprises a bacon intensive meal – save roasting two trays of it in the oven and then shamelessly tucking in. I channeled Lorna for inspiration and decided on bacon sandwiches. But not just plain old bacon sandwiches. I riffled the fridge and pulled out all the big guns. A wedge of Ba Ba Blue, a bunch of tender arugula, and a carton of slow roasted tomatoes with honey and thyme from the freezer. I called Mark and asked him to pick up a loaf of marbled rye on his way home. My bacon intensive meal was coming together just fine. In my book, any grilled sandwich in waiting has two best friends. A well seasoned cast iron griddle and Hellmann’s. Because let me tell you, when a thin smear of Hellman’s meets a hot griddle, it’s a match made in heaven. It doesn’t really matter what’s between the bread. Even a Kraft single will shine. Only in this case it did matter. It mattered because I’m pretty sure it’s a top-ten sandwich, well worthy of repeating. When I was prepping them I had a bout of panic that it was too much. Surely I was going overboard with all of these big flavors. But I wasn’t. They balanced each other perfectly. PERFECTLY! It was one magnificent crunchy, savory, salty, acidic, sweet, bitter, creamy, tangy bacon symphony. Pour a cold, hoppy IPA and prepare for the cymbal crash. 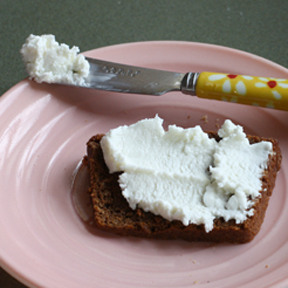 Spread a thin layer of Hellmann’s on the outer surface of each bread slice. 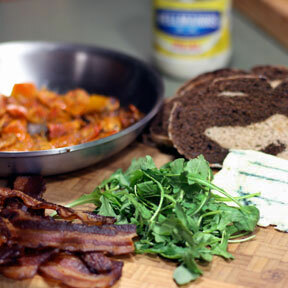 Construct sandwiches by layering Blue cheese, ample bacon, a handful of arugula, a scattering of tomatoes, and a light sprinkling of thyme between two pieces of bread. 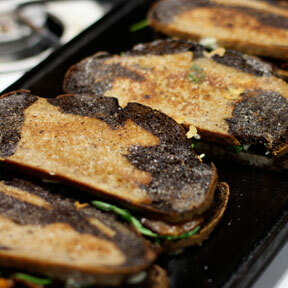 Grill on a medium-hot griddle until nicely browned on both sides, about 5 minutes per side. Makes 5 – 6 sandwiches, depending on the size of your bread. Forgive me. It’s the height of summer (at least up here in Northern Wisconsin) and the garden is finally overflowing. 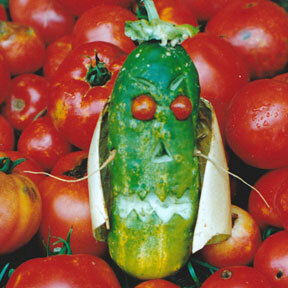 So I feel like I ought to be rattling on about all the ways I have been using my glorious vegetables. But what really has my attention at the moment is biscuits. Mile-high, flaky biscuits. See, I went camping last week with my childhood friend Kathryn. And when Kathryn and camping get together, you can pretty much bet there will be biscuits involved. On this particular trip, it was Kathryn’s dad, Gary, who made the biscuits. But still, there were biscuits. Warm biscuits with butter and honey. Could there be a better way to start a day? To accommodate his daughter’s dietary needs, Gary went all out and tried his hand at making gluten-free biscuits – how sweet is that? Truth be told, they were a bit heavier than your average biscuit. But they were still biscuits. Warm biscuits with butter and honey. And I can assure you that there is certainly not a better way to kick off a day of paddling than with a belly full of biscuits. I give Gary an A+ for effort. His biscuits reminded me that I have been meaning to try a recipe from a delightful little cafe I visited in Charleston, SC earlier this spring. I decided a batch of these old-fashioned biscuits would be just the thing to help me ease back into work and the daily routine. I could take them outside with my morning coffee and pretend like I was still camping. Perfect. I knew I had some White Lilly flour lingering in my freezer that my mom had lugged home from Charleston. 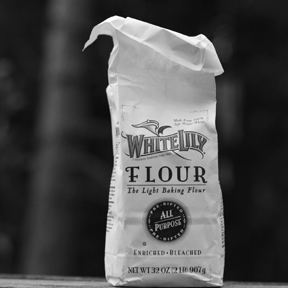 White Lily is a low-gluten flour made from Southern grown soft winter wheat. 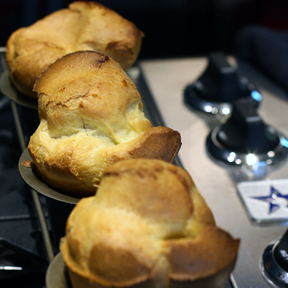 It’s the type that makes extra fluffy quick breads and biscuits. You can substitute cake flour or other low-gluten flours to achieve the same results. While these biscuits may be low-gluten, they aren’t exactly low-fat. But they are so worth it. Especially if you take them outside and pretend like you’re camping. The recipe, which comes from a fun little hand-illustrated cookbook published by the Hominy Grill, calls for all three of the traditional fats – butter, lard, AND shortening. 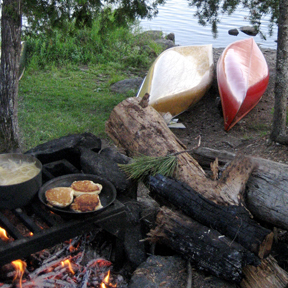 But it’s okay – we’re camping, remember? I don’t keep shortening on hand, so I kept the amount of fat called for the same, but replaced the shortening with butter. I’m sure a true southern cook would detect this omission, but my taste buds were none the wiser for it. And you could no doubt get by with using all butter. 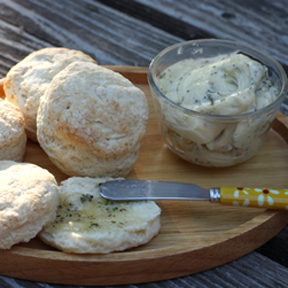 To even further soften my transition back to reality, I made a side of Honey-Thyme Butter to accompany my biscuits. I was inspired by a Honey-Thyme Ice Cream recipe from Amanda Hesser. It’s such a great combination that I wanted to try it in butter as well. I used lemon thyme with the butter and it was perfectly lemony. I’m sure regular thyme would be equally as tasty. For an even more savory treat, try adding a pinch or two of fresh minced garlic into the butter. Maybe it’s just me, but I love the taste of garlic, butter, and honey. A blend that I accidentally discovered years ago while camping – of course! And since I don’t want to completely short-change you on the vegetable front, I’ll at least tip you off to some of my favorite combinations this summer. Zucchini: A riff on a 101 cookbooks recipe, caramelize some shallots and garlic, toss in a layer of zucchini coins to brown on both sides and finish if off with a healthy handful of chopped dill and crumbled feta. Left unattended, I can polish off an entire pan of this in a heartbeat. It also makes a great lunch stuffed into a pita. Green beans: This concoction is adapted from the now defunct Fhima’s in downtown St. Paul. Combine equal parts teriyaki and peanut butter, add in fresh garlic, chopped green onions, and cayenne to taste. Serve over lightly steamed green beans. Sift the dry ingredients together into a large bowl. Cut in the butter and lard with a fork or pastry cutter until you get pea sized lumps of butter. 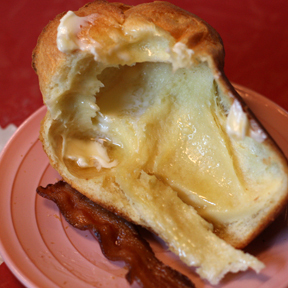 Add in the buttermilk and mix until the ingredients are just moistened. 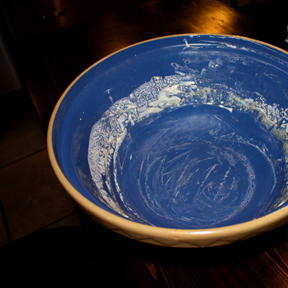 Turn out onto a floured board and knead a few times until a ball forms. Roll or pat the ball into a circle about 1 inch thick. Cut out biscuits with a lightly floured cutter and transfer them to a baking sheet. Bake the biscuits in a 425ºF oven for about 15 minutes, or until they are golden brown. Makes about 12 2 1/2 inch biscuits. Combine and mix well, chill slightly. It’s official. I’m in love. Madly in love. I married a man who makes a homemade pizza almost every Sunday night. He’s missed a few here and there, but by and large, come late Sunday afternoon, he’ll stop what he is doing, don an apron, open a bottle of wine, and take over the kitchen. We celebrated out thirteenth wedding anniversary yesterday. I figure this man has made me well over 600 pizzas. How could I not be in love? I credit myself with having the brilliance to teach him how to make a simple whole wheat crust years before we got married. We were living in a small cabin in northern Maine with no water and no electricity. Our kitchen was small and sparse, but there was just enough room to roll out a pizza crust. But truthfully, my involvement in the matter pretty much stops there. Since then Mark has taken it upon himself to perfect his craft. Years ago he acquired a small jar of sourdough starter from a coworker. I’ve made it clear that I love my husband, right? Good, because that said, I didn’t have high hopes for the starter. Mark is an idea guy. Follow through has never been his strength. But let me tell you, he tends to his starter like nothing I’ve ever seen. If he happens to be away or miss a Sunday, he’ll make a mid-week pizza instead. And if that fails to happen, he’ll be sure to take a little starter out and freshen it up so it’s alive and ready for the next week. Excuse me while I eat my words. And along with them, hundreds of fabulous sourdough crusted pizzas. At some point in this pizza love affair, Mark dubbed Sundays as Bistro Night. He generally spiffs up, puts on a classy shirt, and proceeds to dote on me like I’m a tourist at some crazy Italian café. With lively accordion music playing from the Bose, he’ll offer me a small bowl of black olives to snack on or a slice of fresh mozzarella to tease my palate. Occasionally he puts me to work grating cheese or chopping garlic, but generally he shoos me out of the kitchen. 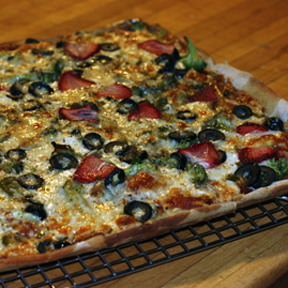 He prides himself on making the thinnest crust possible – because he knows that’s how I like it. And if I really sweet talk him, I can sometimes convince him to make my very favorite crust – a creation where he stuffs the edges with a mixture of cream cheese, chev, and chopped jalepeños. It’s a bit more fussy, so I have to get my request for this in early. In the summer months he takes his café outdoors and throws the pizza on the grill instead. And the toppings! Lets just say that Mark is not shy to experiment. If it’s in the refrigerator, it’s fair game. Chopped broccoli has become a favorite. Other winners include pesto, grilled chicken, artichoke hearts, jalepenño stuffed olives, chorizo, spicy greens, and even fresh strawberries. But the real reason I’m so in love is not about the pizzas. Here’s why I am truly smitten. Still desperately trying to catch up at work, I spent the better part of this past Sunday at my desk. Around 5:00, I went down to the kitchen for a glass of wine and retreated back to my computer. About a half hour later, with familiar smells wafting up through the grate in my office floor, Mark came upstairs with a treat for me. Nothing fancy – just the scraps of left over crust, baked and sprinkled coarse salt. But his presentation was everything. 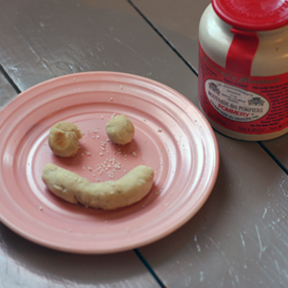 Shaped into a smiley face, served on my favorite little pink plate with a jar of hot mustard to dip into. “Happy Anniversary,” he said, and went back down to the kitchen. Be still my beating heart. It’s been thirteen years and I feel as lucky as ever. I can’t even remember the last time we had a pizza made with a plain-jane crust. 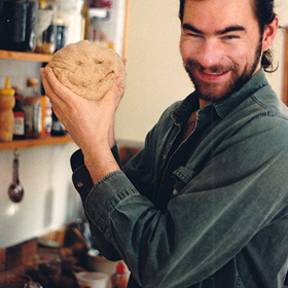 In addition to the sourdough factor, Mark usually kneads a combination of fresh garlic and herbs into his crust. But if he ever left the pizza making in my hands (not likely since he hasn’t yet in 13 years), I would probably turn to the standard whole wheat crust that I grew up with. 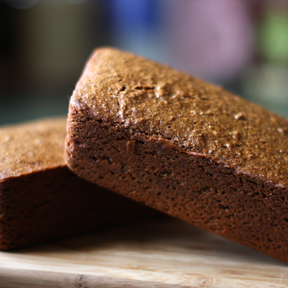 Thin and chewy, it’s one of the very first things I ever learned to make. But in the meantime, I’ll keeping making reservations at the best little bistro I know. Lucky me. Pour warm water into a medium sized mixing bowl and add a few drops of honey. Dissolve the yeast and let it sit for a minute or two. 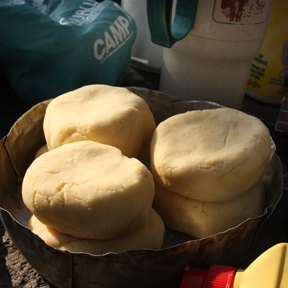 Add salt and gradually stir in flour – enough to make a nice, not too sticky, elastic dough. Knead it 3 - 5 minutes, either right in the bowl or on a floured surface. Let the dough raise, covered, 15 - 20 minutes before rolling out the crust. Preheat oven to 375 degrees. On a floured surface, roll the dough into a circle or rectangle – don’t be affraid to pull and tug the dough a bit to help it conform to your desired shape. Lightly oil a baking sheet, dust it with cornmeal and transfer the crust to the pan. If you like a crispy crust, it helps to pre-bake it about 10 minutes. You can also pre-bake the crust for 10 minutes and freeze it for a quick meal later on. Prepare your pizza a desired and finish baking at 375 degrees until top is bubbly and melted.